Remarkably, this race for the Player of the Week was actually quite good, considering there were only 19 games in three days on the NHL schedule. The pool ended up with three players with 5 points, so we had to really break it down to the tie-breakers and since they were all forwards, it was a good tie-breaker. So, as you can already tell, it was Cam Atkinson of the Columbus Blue Jackets who came away with the honour, beating out fellow teammate Brandon Dubinsky and Rangers forward Derick Brassard. Atkinson played in a pair of games this week, a home and home series against the Montreal Canadiens, where the Jackets dominated both games. In the first game on Monday, Atkinson led the way with a hat-trick and then the following night, in Montreal, he finished off the series with a goal and an assist. With the big week, this brought the speedy winger's totals up to 17 goals and 32 points in 50 games this season, which has him ranked 93rd overall in pool scoring, good enough to be a 4th round pick in the draft, if it was re-done today. This makes him into a pretty good bargain pick-up for Kristy & Don, who picked him up in the 12th round of the draft, an improvement of 205 positions from where he is drafted to where he ranks in scoring. This makes him tied for 7th in the bargain picks column this season. This also gives Kristy & Don back-to-back weeks with the Player of the Week on their team, which is really helping their cause in the standings right now and a good Waiver Draft and a third segment could ensure them more money at the end of the year. Only 10 teams in the pool were able to hit double-digits in the points column this week, thanks to a very limited schedule, thanks to the All-Star break, which gets started today. On top of them all is our pool leaders, who didn't really do much for moving exactly, rather they were able to shake out a 15-point week, despite a glaring scoring change from last week, which wasn't applied until early this week. Brenda & Seward, now sit 10 points clear on top of the standings, thanks to a big week in three days, which cemented their spot as the last pick in each round of the Waiver Draft. 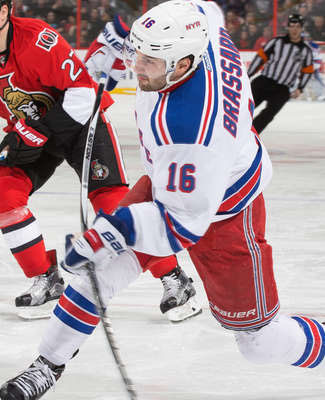 The pool's second duo had one of the Player of the Week candidates, Derick Brassard of the Rangers, who finished the week with 5 points, but his came in only one game this week, as they walloped the Buffalo Sabres. You'd think that doing it one game would earn him the honours, but that's not the predefined tie-breakers, which could be argued for, but it's all arbitrary in the end anyways, so who cares, right? They also had a lot of help from their blueline, as Zdeno Chara of the Bruins and rookie Shayne Gostisbehere of the Flyers each picked up 3 points, giving their team a big boost from the back end. Now, to speak of the glaring scoring change on their team, as Filip Forsberg of the Predators finished with -1 point in the week, which is a scoring change from the week before, which wasn't changed until after Monday's audit. This isn't Forsberg getting massive amounts of points taken away, just one point, so there shouldn't be any riots, right? The pool's second duo look pretty solid from top to bottom this season, so their desire to make any moves at the Waiver Draft should be limited, especially since they will go into Week Eighteen with no names on the injury list. Of course, the Waiver Draft will go right through Sunday next week, so things can change between now and then. For now, they can enjoy the break in 1st place. A limited amount of games on the schedule was bound to hurt a few teams and it sure did. Four teams didn't pass the 5 points mark in the week, which did more to help these teams and their Waiver Draft position, but no one really wants their team to fall off the map that badly. Stacey C., making it four straight weeks with a Stacey in the Basement Dweller, finished with 2 points in three days worth of action. Anze Kopitar of the Kings and Patrick Sharp of the Stars were the only two players on his team to pick up a point this week, as everyone else fell short of the scoresheet. It didn't help that his team had four Oilers on it, who had started their All-Star break before this week even started, as did the St. Louis Blues, but they don't apply to this situation. With the lacklustre week, Stacey's team did improve their draft position by one spot, as they fell to 19th place in the standings from 18th, which means he'll pick 9th, instead of 10th, when the Waiver Draft kicks off. Stacey's team is now 55 points out of the money, heading into the Waiver Draft, 72 points back in the rookie pool, 206 minutes back in the PIM pool and was eliminated in Week One of the survivor pool. I think it's time for Stacey to play spoiler! In the money race, the only notable piece of news from this short week was Brenda & Seward expanding their lead to 10 points in the standings, as both Jeremy and John P. each finished with 7 points and their teams were rather pedestrian. Stuart made up 2 points on the money teams, as he is now 6 points back of 3rd place, nice and close to the money. Kristy & Don also made up some ground, now 14 points back of 3rd place and the hottest team in the second segment will need a good finish to be back in the money. We have a winner! With a Connor Hellebuyck win for the Jets on Tuesday and Braden Holtby dropping his decision to Philadelphia on Wednesday, Allan comes away with top prize in the goalie survivor pool... a $25 gift certificate to Chuck E. Cheese's for all the fun in the ball pits as you can handle! Bazinga! No, of course that's not the prize. Allan has earned his money back with the mini-game win, so he'll get his $60 back in his pocket, which is a great case scenario, since his 16th place team has a long way to go to climb back up into the real money race. Huzzah! As long as the other mini-games go this way, then it was a glorious success. The rookie pool was probably over before it started, but since it won't be officially over until the end of the schedule, we'll continue to report on how many points Ryan is ahead at this point in the season. None of the top three teams in this pool came away with points in Week Seventeen, so Ryan will go into Week Eighteen with a 39-point lead, exactly double of what Clayton has in total, in 2nd place. The first Waiver Draft didn't really help the causes of all the teams chasing Wes in the PIM pool in the second segment, as only one team fared better than our leader in this mini-game and it was only 7 minutes better, not even trying to be that much better in that Waiver Draft either. So far in the second segment of the season, Dale B. holds a 179-172 lead on Wes in penalty minutes, while Brian sits at 162 minutes and Derek & Dan have 155 minutes in the same time frame. Can any of these teams drastically improve upon their goon squad to knock down the huge lead that Wes has this year? It was a good week in the stats, but it was a very small sample size to work from. Scoring was up marginally, skater games played were up with the return of a number of players, but we did see a number of back-up goalies get some starts, which hurt the minutes collected, but that's of little consequence... except for Jeremy. On the plus side, there was a new weekly record in the PIM department, as the pool pulled an average of 12.3 minutes out of every NHL game this week, 1.1 minutes better than the previous weekly record. As of Thursday morning, it appears that Joe Colborne was out of the Calgary lineup with an undisclosed injury, which makes some sense, since his scoring was starting to pick up in recent games, removing the thought that he was actually a healthy scratch against the Predators. He's on the list as out day-to-day for right now, no real updates will likely be provided until after the break, unless the slow news days really catch up to the Flames over the weekend. I have Colborne as a 2nd round drop in the Week Eighteen Waiver Draft for Mike, but that doesn't necessarily have to happen, it just made some sense at the time. His recent scoring streak may have saved his bacon, for now. A regular healthy scratch this season, Lightning defenseman Matt Carle, was back in the press box in the last game before the break, as Tampa Bay was hosting the Maple Leafs, coming away with a 1-0 win. There is very little redeeming qualities to Carle's season and it is likely that he'll find his way back to the press box more times in the third segment of the season. This is why I think Wes will do away with him, as he tries to pad his PIM pool lead with a couple more goon defensemen, as per my mock Waiver Draft, posted earlier in the week. It's all that Wes has left to win any money this year.